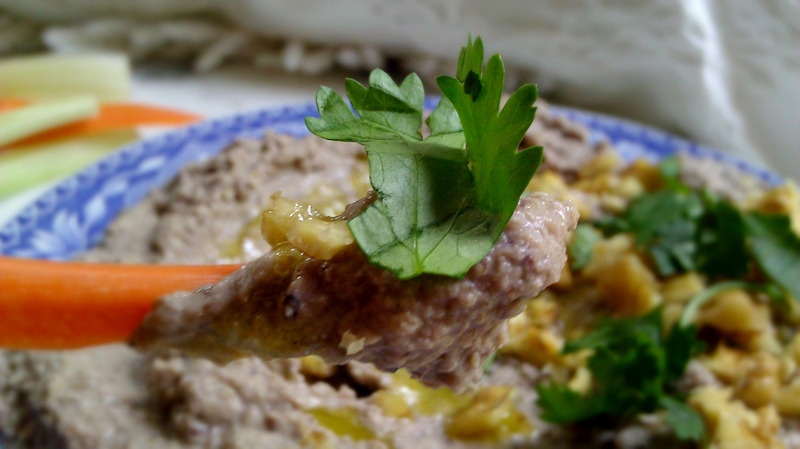 Mung Bean and Walnut Houmous | happyspinach etc. Lately I have been very restless. I want to go do something exciting and adventurous. Go on a road trip, perhaps? To somewhere not terribly famous, but quaint and rustic and charming and just plum-dandy wonderful! It’s actually very strange for me to want to go on a road trip. I tend to not feel so great about an hour into them. Well, maybe just a short little road trip. With plenty of air conditioning to beat the heat. Since a road trip isn’t in my future, however, I’ll just content myself to make some travel-friendly food. Like this houmous. This houmous is mind-blowing delicious. Nutty, smooth, tangy, and zesty all in one bite. It’s quite exceptional really. Oh, darling, let’s be adventurers. As a side note, the nail polish I’m wearing is Moonraker from OPI’s 2012 James Bond collection. 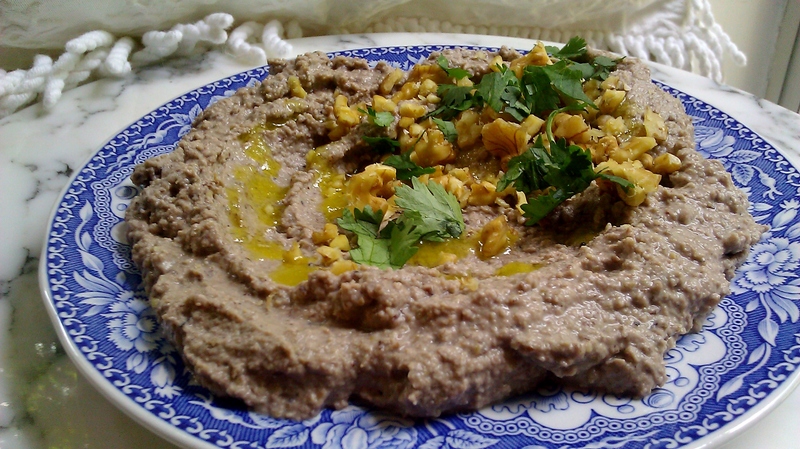 A delightful, lavender/grey-coloured houmous that was inspired by Heidi Swanson, http://www.101cookbooks.com/archives/mung-bean-hummus-recipe.html. This recipe is not only good for a delightful road trip but also an afternoon picnic, or just because! to garnish and serve: thinly sliced chives, chopped parsley, chopped cilantro, roughly chopped kalamata olives, toasted and chopped walnuts, a drizzling of very good olive oil, pitas or some other flatbread, or crudités. In the bowl of your food processor, grind the toasted walnut halves until they form a paste (like making nut butter). Scrape out the walnut butter and set aside. Dump in your mung beans and grind them until they develop a fine and fluffy crumb. This will probably take a minute or so; just go for it! Scrape the bean paste from the sides of the bowl and dump in your walnut butter, lemon juice, garlic clove, and salt. Grind until a thick paste forms. Start adding water, a splash at a time, until a creamy and aerated houmous forms. Garnish with any of the above ingredients, and serve with flatbreads or crudités. 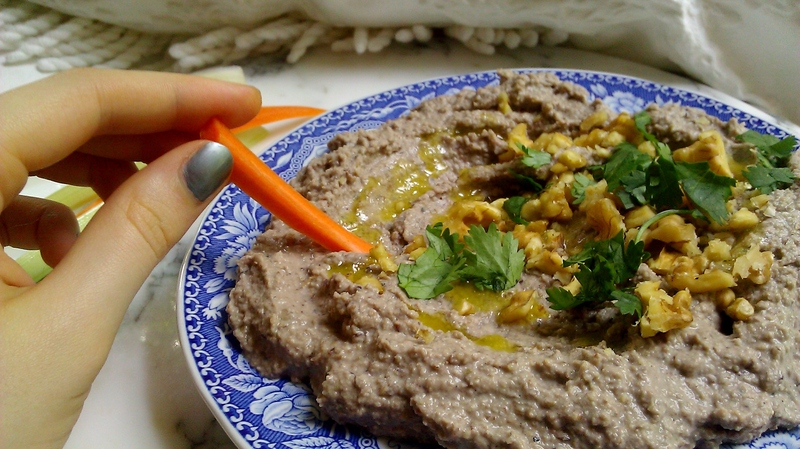 This entry was posted in Dips/Sauces, Garlic, Legumes, Lemon, Lunch, Mung Beans, Nuts, Uncategorized, Vegan and tagged Dip, Garlic, Houmous, Lemon, Lunch, Mung Beans, Picnic, Road trip, Walnuts. Bookmark the permalink.